The ID cards bill will return to the Lords, after MPs voted in favour. 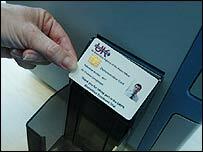 The government has already spent £32m preparing for its ID card scheme even before it becomes law. That means spending rose from £25,000 to £63,000 a day in the last six months of 2005, the Home Office said. The figure follows questions from the Liberal Democrats, whose home affairs spokesman Alistair Carmichael called it "completely unacceptable". Ministers say cards, which have come up against opposition in the Lords, are needed to prevent fraud and terrorism. Last week, MPs voted by a majority of 53 against forcing the government to carry out a report on costs before introducing cards. This overturned an amendment made by the House of Lords to the Identity Cards Bill last month. MPs instead backed a compromisen amendment demanding a report on costs every six months for the first 10 years of the scheme being in place. Speaking of the costs so far, Mr Carmichael said the government had "no right" to spend the money before the ID cards enter into law. "It is completely unacceptable to forge ahead on a scheme which will radically alter British society without the approval of MPs," he said. "The government persistently and wrongly claims that a majority of people want ID cards when it is quite clear that there is major disquiet in the country on this issue." The figures came in a written reply from Home Secretary Charles Clarke. He said that £32.05m had been spent between April 2003 and December 2005. Critics are concerned about the cost and civil liberty implications of the scheme. But ministers say the cards will help prevent identity theft and make it easier to trace terror suspects. Last week, Tony Blair told the BBC he thought the government had "won the argument".